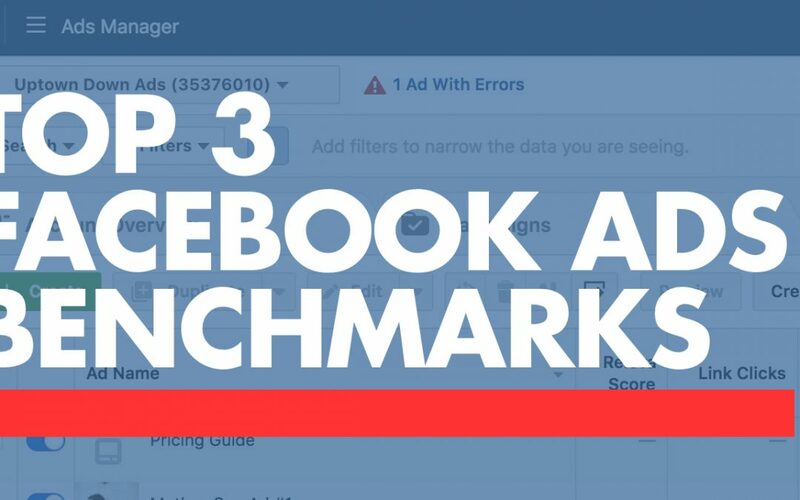 Today we’re talking about Facebook Ad benchmarks. What’s good, what’s bad, what matters, and what doesn’t. When working with Facebook ads, a lot of people want to know what counts as a good, “effective” ad. What’s a good cost per click? What’s a good conversion rate? What should I be trying to aim for? Like the answer to everything in life, it depends on your campaign objectives. But I don’t want to give you an ambiguous, leave-you-hanging answer, so I’m going to do my best to give you some like actionable numbers so you know what to look for when running your Facebook Ads. WHAT’S A ‘GOOD’ FACEBOOK AD CONVERSION RATE? Let’s say you’re running an ad aimed at cold traffic. Audiences that haven’t heard of you, and don’t know anything about your business or service. Maybe you’re a dentist and you’re trying to get new clients. In this case, you’d be creating an ad aimed to bring in local new patient leads. Let’s say that this ad reaches 1,000 people and that out of that number, your ad get 40 clicks. So 40/1000 = a 4% click through rate (CTR). Well that’s pretty darn good. When you’re looking at CTRs (especially for cold traffic that has never heard of you or your business), anywhere between a 3-5% click-through rate is doing pretty good. In this picture, the CTRs in green look ok, but the ones in red DEFINITELY need to be re-evaluated. With warmer traffic, you might get higher than that. It might be 10-20%, but that’s only because people have heard of you and you’ve built up a certain amount of trust with them. After all, are you not much more likely to click on a friend’s post than a total stranger’s? TL:DR: When creating a Facebook ad geared towards cold traffic, try to aim for a 3-5% click through rate. For warmer traffic, look a little higher, maybe in the 7-10% range. Next let’s throw in a little caveat: Assume you’ve gotten a 3-5% CTR… you still have to convert that traffic into leads. A lead is NOT someone viewing your website. Because you can’t reach out to them, you can’t follow up with them, and you can’t get them on the phone. So your landing page has to convert that traffic into actual leads- meaning you have their email/phone number/contact info and can follow up with them. The Facebook ad image is what gets people to stop scrolling, pause, and start reading your ad. The catch here is if your image LOOKS like an ad image, they’ll blow right past it. If you’re going to start testing your ad, start here. If you get a person to stop once they see your image, the next place their eye goes to is the ad’s headline. If it interests them or its relevant to them, they’ll jump to the body copy or just click the ad and read more. Why is targeting ranked 3rd over body copy? It’s for the simple reason that if your ad is targeted well, has a good image, and an intriguing headline, you stand a good chance that person will click through without reading down the body copy (remember, they want to save time). So if your CTR is low, try playing around with your targeting- age, genders, behaviors, interests, etc. If you’ve spent time and really feel like you’ve locked in your Facebook ad image, headline, and targeting, you can try messing around with the body copy. Make it shorter, longer, paint a clearer, more vivid picture of your offering. WHAT’S A ‘GOOD’ COST PER CLICK FOR A FACEBOOK AD? The other day, I was having a conversation with my friend Terrence Hight (of the Hight Effect) about average cost per clicks (CPC) for Facebook ads. The CPC metric came about when Google introduced AdWords, and it’s kind of become the metric that most advertisers use to determine if their ad is doing well or not. The thinking goes the lower the CPC, the better. However, a low cost per click (while beneficial to your wallet) is not the holy grail of benchmarks for Facebook ads. CPC can fluctuate wildly, but don’t let it be the only metric you consider. I don’t even look at my ads CPC most of the time. Let’s say you’ve got a $350 product, and your cost per click is $3. Well, those people whose goal is to get those CPCs down to $0.10-.50 might see this as a failing ad. Let’s assume 1% of those “clicks” leads to someone buying your product. In other words, you’re spending $3 to make $3.50, which is a 116% ROI. Don’t get me wrong, it’s always good to try and lower your CPC (more profit for you! ), but if you’re only basing the success of your ads off getting $0.10 CPC, you’re looking at it wrong. Advertising is an investment. You’re trying to put in $1 and get $1.20 out. Or $1.50. Or $3, or $10. TL:DR: While it’s always totally cool to try and lower your CPC on your ads, it shouldn’t be your be-all-end-all metric for measuring success with Facebook ads. WHAT’S A GOOD FACEBOOK ADS RELEVANCE SCORE? Next, let’s talk about the 3rd important factor when it comes to advertising on Facebook: your relevance score. An ad’s relevance score is measured on a 1-10 scale, with 1 being the worst (least relevant ad in your industry) and then 10 being the best (meaning your ad is extremely relevant/helpful to the audience you targeted). BADDDDDDDD RS. Change these up immediately. So if you have an ad with a 10 as a Relevance Score, then you’re doing pretty darn good. Now how does Facebook calculate that relevant score? It’s all based on how much Facebook expects people to hide or report an ad. The more negative interaction the ad gets (eg, if people click on the button that says “Don’t show me this ad anymore”, the lower the RS. The more positive interactions an ad gets (eg, people give it the thumbs up and engage), the RS goes up. For example, if you’re a dentist and you’re showing your ad to people with no teeth and severe gum disease, your ad is probably going to be a 10. If you’re showing your ad to other dentists with immaculate teeth using name-brand, expensive toothpaste… you’re probably looking at a 1 or 2 for your Relevance Score. Now the relevant score changes every single day. So one day, you could have a 4, while the next you might have a 7 or 8. This all depends on a lot of stuff, but odds are your score will hover within 1-2 points for the duration of your ad’s life. This is my rule of thumb for a relevant score: If I’ve got less than an 8 as a relevant score, I’m re-evaluating that ad. Do I need to improve the image? The targeting? Change the headline? Change the offer? I have a video that walks you through the stages of your offer and gives you the order of importance when you’re A/B testing an ad/landing page. TL:DR: If your Facebook ad is registering an 8 or less for its Relevance Score, start rethinking it, from image all the way down to targeting. HOW HIGH SHOULD I LET MY AD FREQUENCY CLIMB? Finally, I want to talk about ad frequency. This is how many times a person has seen your ad. If your ad has reached 1000 people and has a frequency score of 2.89, it means that everyone in your targeted audience has seen that specific ad about 3 times (1000 people x 2.89). The ad in red needs to be re-crafted. The rest are in the OK range. Why is it important to keep an eye on your frequency score? Your audience can suffer from what’s called “ad fatigue”. Ad fatigue is when people see your ad too many times. I immediately think of ads for YouTube Red- these ads seem to follow me around the internet all day and I probably see them a half-dozen times before I even get to my lunch break. As a rule of thumb, you probably want to keep your frequency between 1-2. So once your ad creeps above 2 in frequency, you might want to start thinking about another ad. It can be the same offer- just change up the creative/targeting. TL:DR: Try to keep your ad frequency down between 1-2. After that, change up the ad creative. So those are some Facebook Ad benchmarks for you. Go check yours out see if yours fall within these general parameters. If they’re too far outside, you might want to consider changing them up. To get a little more information on all these numbers, check out the video below.